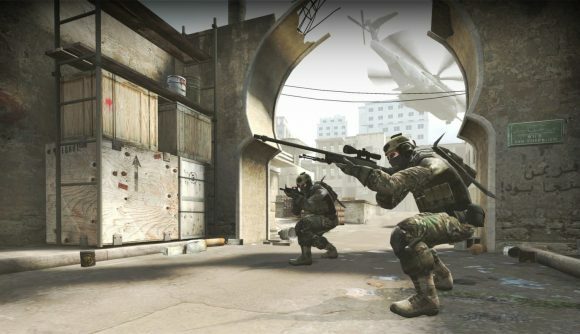 Sometimes, things can go very wrong, very quickly in a game of CS:GO. Like last night, when one of my teammates missed a shot that very nearly spawned a game-winning comeback for the enemy team. Other times, however, things go very, very right, as documented in a clip that surfaced last night. The video, which was posted to Reddit last night, shows a match on Cache. The player in question, who goes by Kipington, buys an SSG and then quickly heads in the direction of B site from the counter-terrorist’s spawn. Rather than running straight onto the site, however, they stop short, turning to aim at the wall behind them. From there, they turn to aim at the metal door leading to the corridor to the side of room in front of the site. They take a shot, which blasts through the wall, heads across the next room, and headshots a terrorist as they run down the corridor next to the toxic barrels. It’s an impressive feat, but it wasn’t all that Kipington had to offer. A second shot at the same spot yields no results, but the next one scores another headshot. A fourth shot comes quickly afterwards, securing a third kill, this time on the bomb carrier. For no loss, the play turns a theoretically even round into a 5v2. What’s more, from their position, Kipington essentially remains invisible to the enemy team. There’s a modicum of luck involved, of course, as the triple-kill did require those terrorists to essentially line up one by one, but it’s still a pretty impressive move (and a wise prediction of that B rush). You can check out the move for yourself in the video above. I’d suggest it shows you how to do this yourself, but there’s no way anyone’s going to be able to pull off that level of success.